My previous post was filled with pretty pictures sharing with you these new end tables David and I made last week. Click to that post for added visual details and the story behind creating this new addition to our living space. Blog posts load far too slowly to include all the pictures of both the process and the finished item in one post. 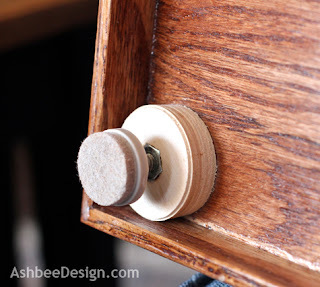 This is the "how-to" post for our new end tables with hidden extra storage. 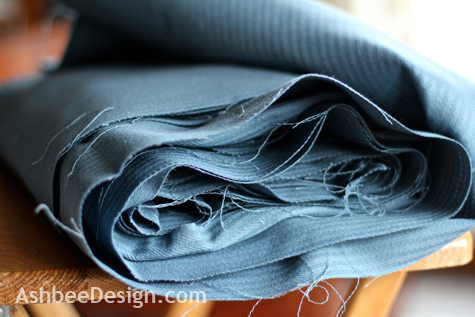 Fabric - enough to cover the cylinders and in a medium weight. You don't want to see through it. 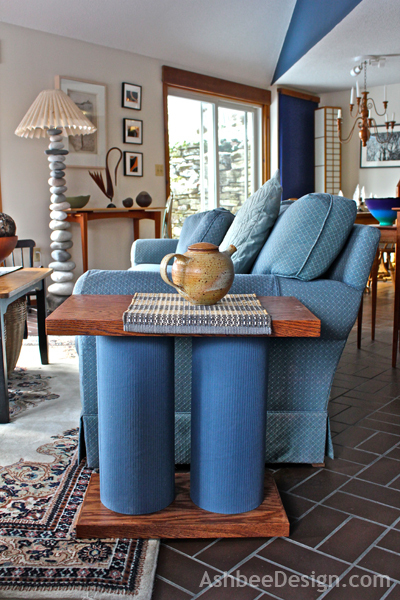 Concrete footing tubes- We used 8" diameter and purchased enough for 2 lengths at 20 1/4" for each end table. 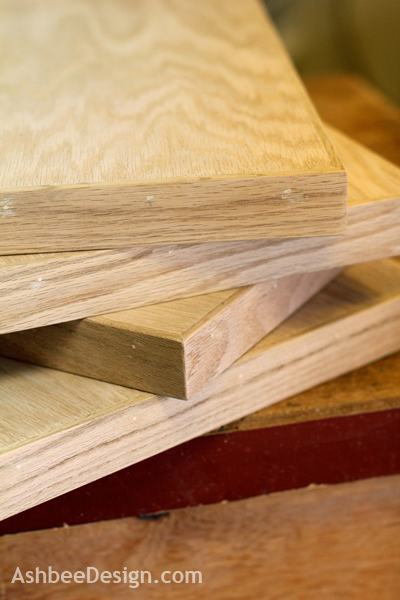 Veneer covered 3/4 ply wood for top and base. We used oak although would have preferred cherry. 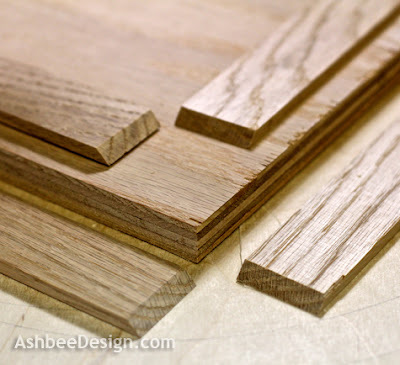 Oak was available in 2' squares at Lowes. This project required 1 24"x24" square for each table. 4 wood screws 1 1/4"
Saws - we used both a table saw and a band saw. This could have been done with a skill saw and a guideline jig or you could have the top and bottom cut to size at the home improvement store for a fee. Note: I am very lucky to have access to my husband's workshop and to some great power tools. This project can be done with other methods as well and I have noted that through out the instructions. You don't need a wood shop like this one to create this project! Cut the top and bottom to size. Ours were as follows but you can customize this to meet your space. David used a table saw because we have one but the plywood could have been cut by the folks at the home improvement center for a fee, or by using a skill saw and straight guide. Just be careful to have a good blade and cut so that if the wood splinters, it will be on the bottom. 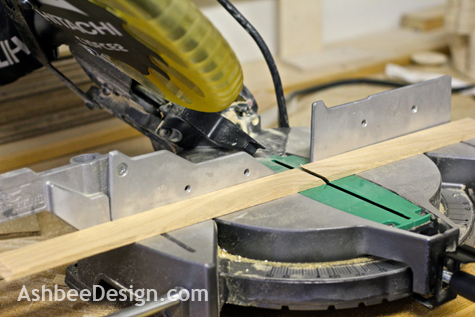 Cut the trim to fit all four sides with 45º angles for the top and bottom using the miter saw. Precision is important here so practice on scrap wood. Drill little holes evenly spaced in the trim to attach it to the sides of the tops and bottoms. This is to hammer brads in to hold the trim in place. The hole needs to fit the brad. Nailing directly through the trim will probably cause it to crack. I spaced the holes every 3". I used a drill press but this could have easily been done using a hand drill. 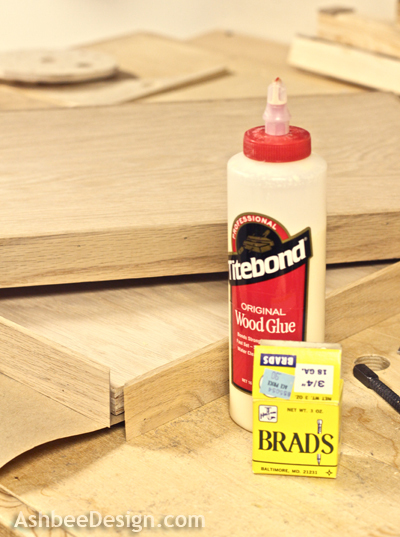 Apply a layer of the wood glue to the edge of the top and nail each trim piece in place carefully lining up the corners and the top edge. Wipe off all excess glue. Use a nail punch to recess the nails. Fill the holes (and any bad corners) with plastic wood and allow to dry. Plastic wood tends to shrink so I added a second layer and allowed that to dry as well. Sand everything well. I used both 80 grit and 120 grit sand paper. Pay especially close attention to any areas where the glue seeped out. You must be sure to sand all of that off or the stain won't take there. Meanwhile, during the various drying times, start work on the cylinders. David cut our cylinders to length on the table saw but a hand saw could be used as well. Select your fabric. I used fabric scraps leftover from when we had our window shades professionally covered. I had to sew the strips together. I also hemmed the upper and lower seams to prevent unravelling. This step isn't necessary but does lead to a more finished look on the inside. 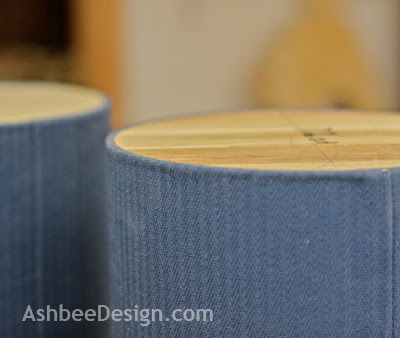 The final seam that will show on the outside of the cylinder is important. It will be glued in place and visible. I worked carefully to cut this even with the weave to limit unraveling. If I had a loose weave fabric I would have hemmed that seam. I am relying on the glue to hold in place. 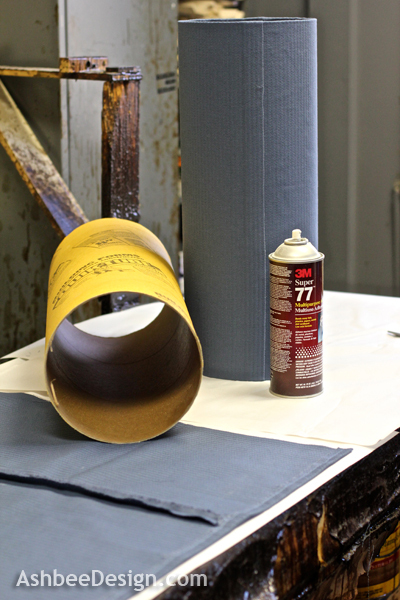 Working in a well ventilated area, spray glue onto both the cylinder and the fabric. Also spray glue inside both the top and bottom edges of the cylinder.You have about 30 minutes to carefully place the cylinder onto the fabric and roll the fabric around it being careful to avoid wrinkles and creases. Fold the fabric down into both ends. Here puckers will form and that is ok. The glue you sprayed inside holds the fabric in place. Now back to the wood parts. 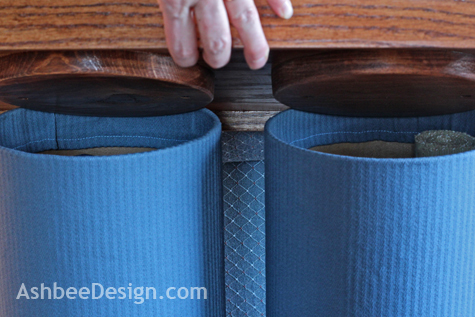 Cut and sand wooden circles to fit inside the cylinders with attached fabric. You need one for each bottom and these need to be a fairly close fit. You need one for each top and these should taper to make them easier to put on and off. 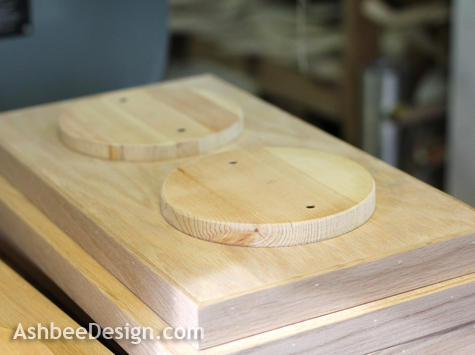 I cut these out of scrap pine but 3/4" plywood would work as well. Above is a good view of the two bases with the disks attached. The cylinders slide over those disks. 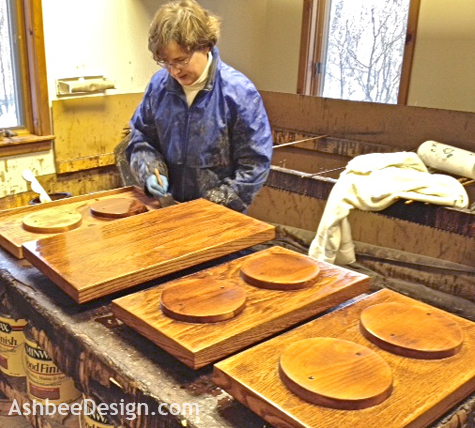 Once the stain is dry, apply two coats of satin finish polyurethane and allow to dry. Apply a liberal coating of epoxy to the edge of the disks on the base and slide the cylinders over them. Place the top on the end table and put a weight on top of that until the epoxy is set. I used 2-ton epoxy which has a 30 minute set time. Note- there is NO epoxy on the top part. I added 4 leg levelers to the underside of the base. These allow me to adjust the table so it won't wobble. 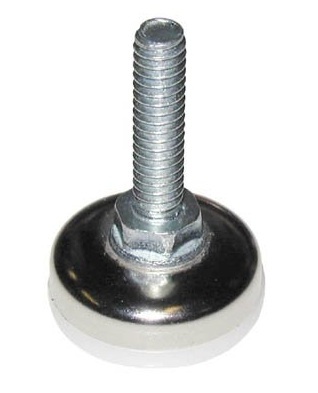 I inserted nuts into scrap disks and glued them into each corner of the base. We brought all the parts into the living room and assembled them in place. 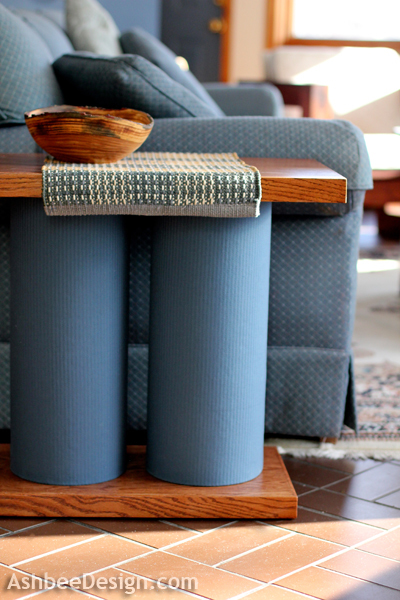 An end table went on each end of the sofa. 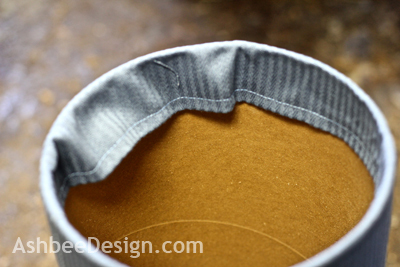 I know, round storage is a little weird but I knew when I designed these that I needed storage for my table runners. 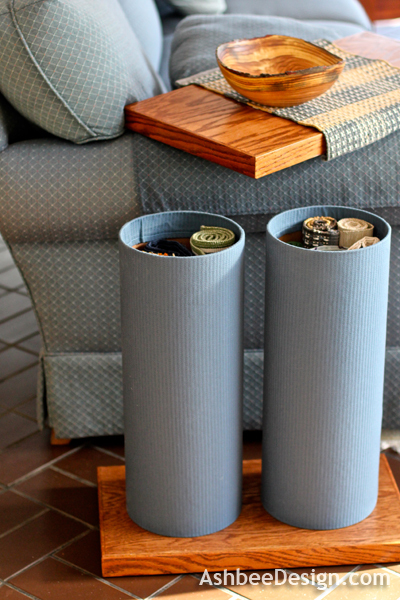 Those roll up and store beautifully in the cylinders and are now conveniently located right next to the dining table. The tables were designed specifically for this use. And for coffee and tea cups! These would also be a beautiful storage spot for knitting needles, yarn and a knitting project, right next to the couch! Or how about a soft fleece blanket? Oh that's pretty genius. All of that extra storage? Awesome. Those tables are interesting, creative and NOT run-of-the mill - that seems to be exactly what you and your husband are (awkward sentence, I know). Going back to the laundry room, would it be possible to hang your folding chairs on the back of the door? Pictures look like the space is too tight but maybe there is room; just a thought! Your suggestion got me out of my chair and into the laundry to go and look at the possibilities, but no. The doesn't open all the way now because of the laundry chute. If I put the chairs behind it, that would further restrict the door. Thanks for the suggestion though- would have been a good one if the room was just a smidgen larger. Thanks for visiting and commenting. Personal effects as well as décor tend to be exactly what turn a functional outdoor family room right into a spectacular man cave. Posters and paintings can transform the space, especially movie adverts, tour paper prints or limited edition images. For those who have collectibles that forms a group, such as for comic books, films or soccer, show all of them well allthingspatio.ca. Have been getting outdoor furniture (seats, tables, couches, and even a stone bench in my garden) because cr plastics adirondack chairs. Usually with excellent stuff (thoroughly researched before choosing) and never disappointed, Reasonable pricing, and always ready to tell a great tale!